Earlier this year, on her way to post-birth recovery, Williams told People magazine that she was "devastated" over her unplanned C-section, which left her with a painful and permanent scar she hadn't emotionally prepared for. 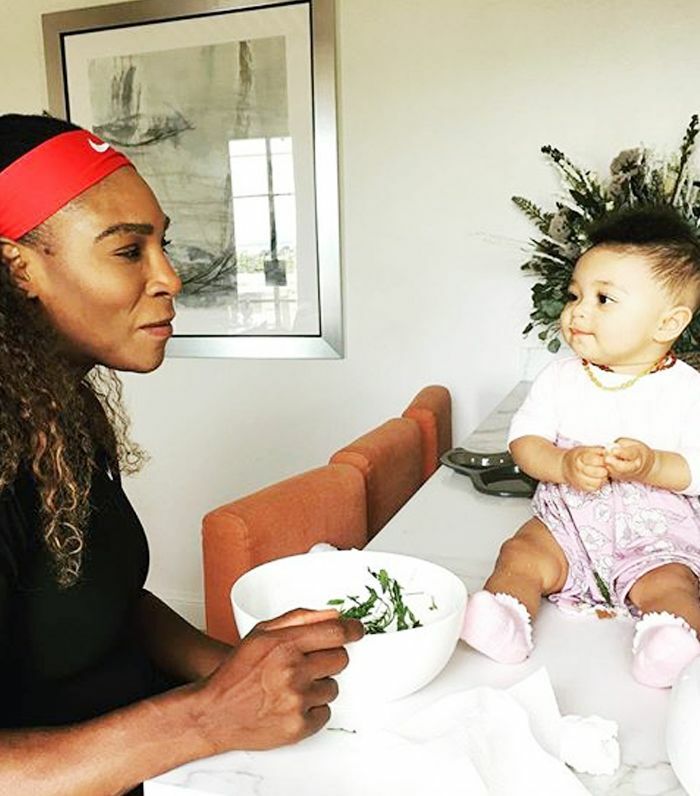 "Motherhood is challenging in ways that I couldn't even imagine," she told Byrdie when we hopped on a phone call shortly after she competed in Wimbledon last month for the first time since becoming a mom. Williams's C-section experience led her to start using Embrace, a scar-prevention treatment that works on any injury by contracting to relieve the skin's tension at the incision site—she swore by the product so fervently that she now works with them as an ambassador. We were #blessed with an interview with the athlete to chat about how recovery is going almost a year since her daughter's birth—her greatest emotional and physical challenges as a new mom and how she feels about society's standards for bouncing back to your post-baby body. Keep scrolling to read our refreshingly candid conversation. What were your biggest physical or mental challenges after giving birth, and how did you deal with them? Well, the main reason we’re on the phone is to talk about Embrace, and though that’s not a part of my routine anymore, in the beginning of motherhood, it totally was. During my recovery process, someone told me about it, and I tried it, and it immediately relieved a lot of the pain that I was feeling. It helped my scar look a lot better really, really fast. And it’s the easiest routine because you only have to change it every five to seven days. I would work out in it, and it was great. When you have a C-section, you have fear. You think, “What’s it gonna look like?” You’re afraid you’re going to have this nasty scar. And they’ve come a long way with the procedure, but still, it’s something on your body that’s new, and it’s always gonna be there. So using Embrace helped me regain a lot of confidence in myself. Right, because I imagine an emergency C-section must be a real shock to have to wrap your head around suddenly. It is shocking. You don’t go in expecting it. So then when you get it, it’s like… It is shocking. Is there anything you think doctors can do to be more sensitive to new mothers’ feelings and bodies when they break the news that they have to have a C-section? I was really lucky to have literally the best doctor I could have. She was amazing. She told me [that I would need C-section] with such confidence and assuredness. It made me think, Okay, I believe in this woman wholeheartedly. This is what I want to do, and it’s best for the baby. If she hadn’t had that confidence and assuredness and matter-of-fact [delivery], it could have affected my kid. I might not have a healthy kid right now. And of course, it depends on the situation. In my case, it was an emergency C-section. Some women might not need it, or some women might opt for it. I’m not a doctor, though, so I can’t comment too much on that. I think it’s just about doctors being confident that they’re doing what’s best for the baby. Do you have any products or wellness habits that you swear by as a new mom? Eating clean is super important to me to help me keep my energy up, and it helps a lot with recovery on the court. I’m also someone who uses natural products. I use a lot of coconut oil. For everything. What did America even do before the coconut-oil craze? What are your thoughts on society’s pressure for new mothers to get back to their “pre-baby bodies”? I feel like the quote, unquote “snapback” is so overrated. I’m still snapping back. I was playing in Wimbledon, and I totally have a stomach. You know? It’s no secret. It is what it is. And I’m proud of my tummy. It pokes out a lot more than it used to, but I’m still coming back from having a baby. I just feel like this whole story about having a baby and then coming back two days after and looking better than before is not teaching the right way or the natural way or the believable way. Like maybe that happened to one person, but let me tell you, that didn’t happen to me. So that really frustrates me. I just want to straighten that record that it takes time, and it’s okay. I’m playing in Grand Slams with a tummy, and I’m okay. It’s just how my body is. My intestines are still trying to get back in place. That’s my whole attitude. It’s normal to be a woman and not come back in a week. It’s so inspiring to hear that your body can still accomplish amazing things even if it doesn’t look like it’s “supposed” to look by our wacky standards. Any last words of wisdom for new moms? I would just say that your body is imperfectly perfect after having a baby. Some people come back to what they looked like or better, but it takes a little bit longer. And some people end up having stretch marks or scars, like me. I would say, first of all, get Embrace Active Scar Defense, because it’s amazing. And second of all, I’d say embrace your imperfectly perfect body, because it produced an amazing human. Want more celebrity exclusives? Next, don't miss how "micro-decisions" are Nicole Kidman's secret to happiness.